The 592.5-meter -tall Ping An International Financial Center (PAFC), towering over the concrete jungle of Futian CBD like a sharpened lance, perfectly portrays the Shenzhener’s life abounding with challenges and opportunities. After striving for their dreams in the skyscraper the whole day, white-collars, often in bands of two or three, patronize international delis in COCO Park for a decent meal. 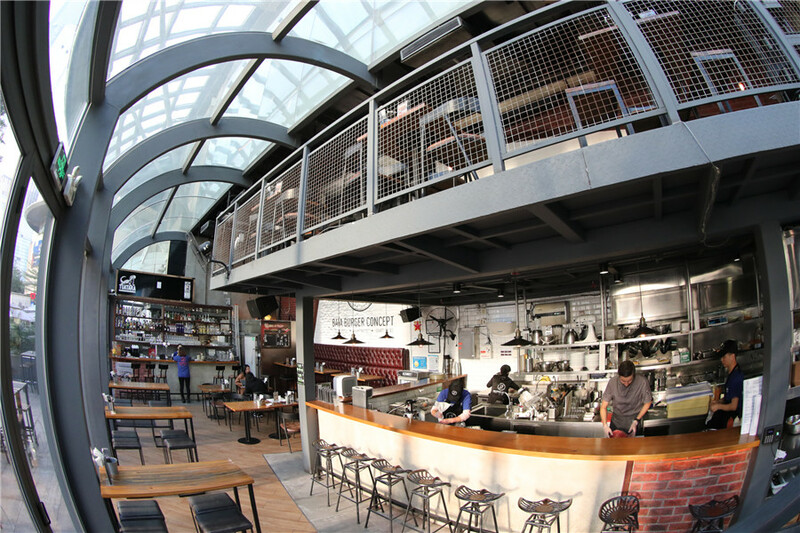 Denys Ivakhnenko, a Ukrainian chef, makes authentic American burgers at a restaurant named BAIA Burger Concept, which sits just opposite the cloud-capped building. Looking much younger than his age, Ivakhnenko is a veteran chef with 17 years of experience in the catering industry. After earning a culinary degree in Ukraine, he worked in an Italian restaurant before relocating to China. Having lived in Shenzhen for four years, Ivakhnenko’s memories mostly linger around Futian District and Shekou. “I feel that Futian is a place with bustling business and a fast-paced lifestyle,” he said. “In Futian District, businesspeople often drop in quickly for their lunch or dinner, while in Shekou, people opt to chill at our restaurant with their families or friends over the weekends.” To echo the idiosyncrasies of Futian as a business district abounding with office buildings, the restaurant offers a “90 minutes after work” meal deal during the peak evening hours, which includes a hamburger and a complimentary glass of beer or wine. 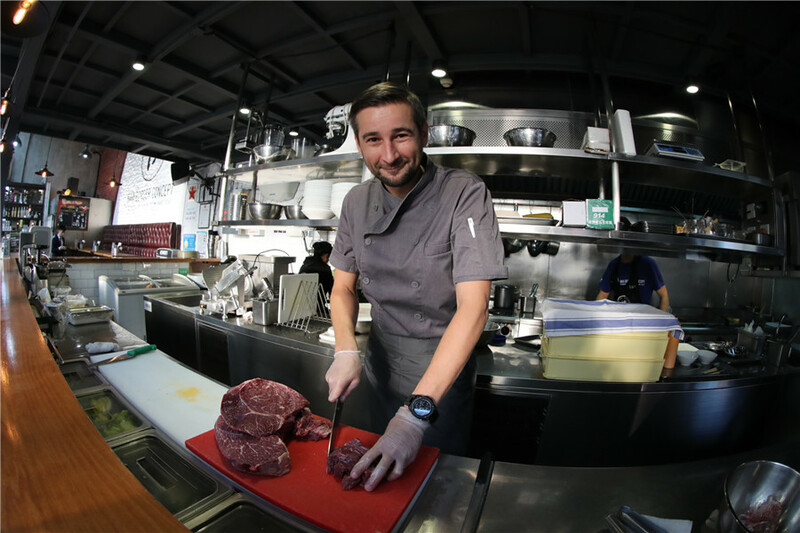 Like many other foreign chefs working in China, Ivakhnenko has a trilingual WeChat Moments, promoting his hamburgers in Chinese, English and Ukrainian. In addition to promoting via social media, the restaurant offers a collection of deals to its customers, like the after-work meal deal, a brunch deal and a special menu for students or visitors during public holidays. When asked how a chef can succeed in a foreign country, Ivakhnenko stated that one should gain a thorough understanding of the target culture, especially in China, where an old saying has prevailed over thousands of years — food is the staff of life. “You need to understand the local culture clearly, know what the locals like to eat and cook from the heart to meet their taste,” he said, adding that every chef should be ready to play an all-purpose role at a restaurant nowadays, from cooking in the kitchen to making cocktails as a bartender, from collecting feedback from the customers to taking charge of the operations. He also gave some suggestions on how to cope with complaints. “Of course, opinions on how a dish should look and taste may vary from person to person. However, nobody will turn up their nose at perfect food. So, the only thing you should do is work as hard as possible to make your dishes impeccable,” said Ivakhnenko. It’s widely acknowledged that a chef is often a gourmet who feeds on delicacies. Since coming to China, Ivakhnenko, who has long been a big fan of Italian food, has also been intrigued by Chinese cuisine, especially Beijing Roast Duck. He has also tried to make some simple dishes like Chinese salad at home.